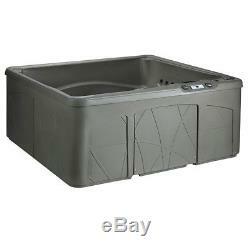 Life Smart 5 Person Outdoor Patio Hot Tub Spa w/ 28 Jets, Cover, & Steps, Taupe. Part Number: LS350DX + LS350DX-STEP. 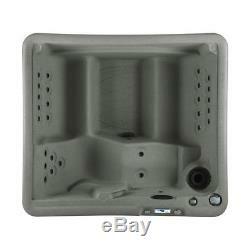 Life Smart LS350DX 5-Person Outdoor Hot Tub Spa. Seats up to 5 people with bench seating and 28 built-in jets (including 2 calf jets). Integrated 1 HP pump included - simply fill with a garden hose. Control jets, temperature, and lighting with the digital control panel. Includes a 2-inch ASTM-approved locking thermal cover and full foam insulation. From beach resorts to the ski lodges, people get excited just about anywhere there's a hot tub involved, so why not take those relaxing bubbles home with you with the Life Smart LS350DX 5-Person Outdoor Hot Tub Spa & Steps? Set it up, plug it into a standard outdoor outlet on your patio, and fill with a garden hose. This hot tub comes with all the fixings you need to enjoy some R&R in no time, including an integrated 1-horsepower pump, air flow control system, built-in lighting, digital control, and filtration. Multicolored LEDs and the 28 built-in jets, as well as temperature control are at your fingertips with the digital controls. Also included to complete your spa experience is the Life Smart Spa Steps. These taupe steps feature a straight back design to sit flush against the side of your spa. Their solid Permalast construction makes sure these steps are maintenance-free and provides years of continued use. This spa has a Ozone Water Care System as well as a standard 2-inch ASTM-approved locking thermal cover to protect your hot tub from the elements when you're not soaking up the chill vibes. Features Ozone Water Care System, an air flow control system, built-in lighting, digital control, and filtration. Adjustable dials allow for the perfect air and water mix. Exceeds the California Energy Commission standards for spas and hot tubs. Adjustable waterfall and underwater multi-colored LED lights. Plug into a standard outlet with 110/120-volts and a 15-amp circuit. Bottom drain for easy maintenance. Dimensions (L x W x H): 72 x 81 x 34 inches. 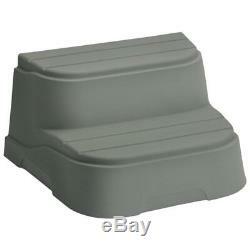 LifeSmart 2-Step Non-Slip Straight Hot Tub Spa Steps, Taupe. Solid Permalast construction for maintenance free use. Taupe steps that match any taupe colored spa. Straight step made to fit any rectangle or square spa. Dimensions (L x W x H): 24 x 28 x 15 inches. From quick weeknight meals to major feats of entertaining, trust Hamilton BeachÂ® household appliances to help you shine. Where Good Thinking and value intersect. For over 100 years, Hamilton Beach has been the reliable resource to help you in the kitchen and around your home. We take pride in our product quality and innovative solutions that improve everyday living. We live and breathe Good ThinkingÂ®. S an attitude and a state of mind that comes to life through our products and permeates everything we do. Developing superior, groundbreaking appliances that meet or exceed the needs of our customers is our passion. Re proud that our products continue to earn praise and acclaim from consumers. Cancelling Your Order: Your order is important to us and will be processed immediately. Select the reason for the return. This listing is currently undergoing maintenance, we apologise for any inconvenience caused. 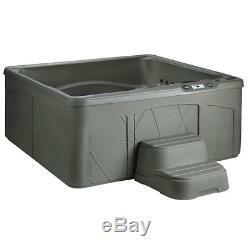 The item "Life Smart 5 Person Outdoor Patio Hot Tub Spa with 28 Jets, Cover, & Steps, Taupe" is in sale since Tuesday, November 6, 2018.